Giraffe Heart Wood Earrings made from Eco-Friendly Wood! Your soft and gentle nature are some of your best characteristics. You find a deep love for animals, and those similar to you! 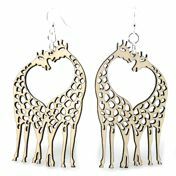 These giraffe heart earrings are a wonderful match for your lively manner.